Predominantly Taoism, Mahayana Buddhism, traditional Chinese religions, and atheism. Small but significant Christian and Muslim minorities. This article is about the majority ethnic group within China. For other uses, see Han. Han Chinese (Simplified Chinese: 汉族 or 汉人; Traditional Chinese: 漢族 or 漢人; pinyin: hànzú or hànrén) are an ethnic group indigenous to China and the largest single ethnic group in the world. Han Chinese constitute about 92 percent of the population of the People's Republic of China and about 19 percent of the entire global human population. There is substantial genetic, linguistic, cultural and social diversity among its various subgroups, mainly due to thousands of years of regionalized assimilation of various ethnic groups and tribes in China. The Han Chinese are a subset of the Chinese nation (Zhonghua minzu). An alternate name that many Chinese peoples use to refer to themselves is "Descendants of the Dragon." Han Chinese are traditionally symbolized by the color red. The history of the Han Chinese ethnic group is closely tied to that of China. Han Chinese trace their ancestry back to the Huaxia ( 華夏), people who lived along the Yellow River in northern China. The name “Han” comes from Han Dynasty (漢朝, which ruled over a unified China from 206 B.C.E. to 220 C.E.. Over the centuries the Han have absorbed many ethnic groups, taking on aspects of their culture and language. The Han speak a variety of dialects and even distinct languages, which are sometimes mutually incomprehensible, but share a common writing system based on Mandarin. 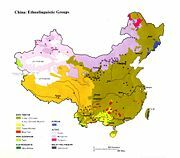 Map of ethnolinguistic groups in China (Han is in brown). The name Han comes from the Han Dynasty ( 漢朝, 206 B.C.E. – 220 C.E. ), which succeeded the short-lived Qin Dynasty ( 秦朝) that united China. It was during the Qin Dynasty and the Han Dynasty that the various tribes of China began to feel that they belonged to the same ethnic group, compared with other ethnic groups around them. In addition, the Han Dynasty is considered a high point in Chinese civilization. It was able to expand its power and influence to Central and Northeast Asia, and rivaled the Roman Empire in population and territory. In English, the Han Chinese are often, and in the view of many Chinese, incorrectly, referred to as simply "Chinese".Discussion of whether or not the use of the term “Chinese” correctly or incorrectly refers only to Han Chinese often becomes heated, because the restriction of the term “Chinese” to Han Chinese can be viewed as calling into question the legitimacy of Chinese rule over non-Han areas. Amongst some southern Han Chinese, a different term exists within various languages like Cantonese (広東語. Yue (粵語), Hakka (客家) and Minnan (閩南語) – Tángrén (唐人, literally "the people of Tang"). This term derives from a later Chinese dynasty, the Tang Dynasty (唐朝), which is regarded as another zenith of Chinese civilization. The term survives in one of the Chinese names for Chinatown: 唐人街 (pinyin: Tángrénjiē); literally meaning "Street of the people of Tang." Another term commonly used by Overseas Chinese is Huaren (Simplified Chinese: 华人; Traditional Chinese: 華人; pinyin: huárén), derived from Zhonghua (Simplified Chinese: 中华; Traditional Chinese: 中華; pinyin: zhōnghuá), a literary name for China. The usual translation is "ethnic Chinese." The term refers to "Chinese" as a cultural and ethnic affiliation and is inclusive of both Chinese in China and persons of Chinese descent residing abroad. The history of the Han Chinese ethnic group is closely tied to that of China. Han Chinese trace their ancestry back to the Huaxia (華夏), people who lived along the Yellow River in northern China. The famous Chinese historian Sima Qian's Records of the Grand Historian dates the reign of the Yellow Emperor, the legendary ancestor of Han Chinese, to 2698 B.C.E. - 2599 B.C.E. Although study of this period of history is complicated by lack of historical records, the discoveries of archaeological sites have identified a succession of Neolithic cultures along the Yellow River. Along the central reaches of the Yellow River were the Jiahu (賈湖) culture (7000 B.C.E. to 6600 B.C.E. ), Yangshao culture (仰韶文化)(5000 B.C.E. to 3000 B.C.E.) and Longshan culture (龍山文化)(3000 B.C.E. to 2000 B.C.E.). Along the lower reaches of the river were the Qingliangang culture (5400 B.C.E. to 4000 B.C.E. ), the Dawenkou culture (大汶口文化) (4300 B.C.E. to 2500 B.C.E. ), the Longshan culture (2500 B.C.E. to 2000 B.C.E. ), and the Yueshi culture. The first dynasty to be described in Chinese historical records is the Xia Dynasty ( 夏朝), a legendary period for which scant archaeological evidence exists. They were overthrown by peoples from the east, who formed the Shang Dynasty(商朝 ) or Yin Dynasty (殷代) (1600 – 1046 B.C.E.). Some of the earliest examples of Chinese writing date back to this period, from characters inscribed on oracle bones used for divination. The Shang were eventually overthrown by the people of Zhou, which had emerged as a state along the Yellow River sometime during the second millennium B.C.E. The Zhou Dynasty ( 周朝) was the successor to Shang. Sharing the language and culture of the Shang people, they extended their reach to encompass much of the area north of the Yangtze River. Through conquest and colonization, much of this area came under the influence of Sinicization and the proto-Han Chinese culture extended south. However, the power of the Zhou kings fragmented, and many independent states emerged. This period is traditionally divided into two parts, the Spring and Autumn Period and the Warring States Period. This period was an era of major cultural and philosophical development known as the Hundred Schools of Thought. Among the most important surviving philosophies from this era are the teachings of Confucianism and Taoism. The era of the Warring States came to an end with unification by the Qin Dynasty (秦朝), which conquered all the other rival states. Having unified China, Qin Shi Huang (秦始皇) declared himself the first emperor, using a newly created title and setting the precedent for the next two millennia. He established a new centralized, bureaucratic state to replace the old feudal system, creating many of the institutions of imperial China, and unified the country economically and culturally by decreeing a unified standard of weights, measures, currency, and writing. However, the reign of the first imperial dynasty was to be short-lived. Due to the first emperor's autocratic rule, and his massive construction projects such as the Great Wall which fomented rebellion among the populace, the dynasty fell soon after his death. The Han Dynasty (漢朝) emerged from the succession struggle and succeeded in establishing a much longer-lasting dynasty. It continued many of the institutions created by Qin Shi Huang, but adopted a more moderate rule. Under the Han Dynasty, arts and culture flourished, while the dynasty expanded militarily in all directions. This period is considered one of the greatest periods of the history of China, and the Han Chinese take their name from this dynasty. The fall of the Han Dynasty was followed by an age of fragmentation and several centuries of disunity amid warfare by rival kingdoms. During this time, areas of northern China were overrun by various non-Chinese nomadic peoples which came to establish kingdoms of their own, the most successful of which was Northern Wei (北魏), established by the Xianbei (鮮卑). The inhabitants of these areas were called Hanren, or the "People of Han" to distinguish them from the nomads of the steppe. Warfare and invasion led to one of the first great migrations in Han population history, as the population fled south to the Yangtze and beyond, shifting the Chinese demographic center south and speeding up Sinicization of the far south. At the same time, in the north, most of the nomads in northern China came to be Sinicized as they ruled over large Chinese populations and adopted elements of Chinese culture and Chinese administration. The Xianbei rulers of the Northern Wei ordered a policy of systematic Sinicization, adopting Han surnames, institutions, and culture. Han China is one of the world's oldest and most complex civilizations. Chinese culture dates back thousands of years. Some Han Chinese believe they share common mythical ancestors, the patriarchs Yellow Emperor (黄帝) and Yan Emperor (炎帝), some thousands of years ago. Hence, some Chinese refer to themselves as "Descendants of the Yan and/or Yellow Emperor" (Traditional Chinese: 炎黃子孫; Simplified Chinese: 炎黄子孙), a phrase which has reverberative connotations in a divisive political climate, such as that between mainland China and Taiwan. Throughout the history of China, Chinese culture has been heavily influenced by Confucianism. Credited with shaping much of Chinese thought, Confucianism was the official philosophy throughout most of Imperial China's history, and mastery of Confucian texts provided the primary criterion for entry into the imperial bureaucracy. Han Chinese speak various forms of the Chinese language; one of the names of the language group is Hanyu (Traditional Chinese: 漢語; Simplified Chinese: 汉语), literally the "Han language." Similarly, Chinese characters, used to write the language, are called Hanzi (Traditional Chinese: 漢字; Simplified Chinese: 汉字), or "Han characters." Despite the existence of many dialects of Chinese spoken languages, one factor in Han ethnic unity is the Chinese written language, which has a unified standard form, regardless of local variations. This unity is credited to the Qin dynasty (秦朝) which unified the various forms of writing that existed in China at that time. For thousands of years, Literary Chinese, which used vocabulary and grammar significantly different from the various forms of spoken Chinese, was the standard written format. Since the twentieth century, written Chinese has usually been vernacular Chinese (白話), a style which is largely based upon dialects of Mandarin, and not the local dialect of the writer (with the exception of the use of written Cantonese). Thus, although the residents of different regions might not necessarily understand each other's speech, they would be able to understand each other's writing. Chinese names are typically two or three syllables in length, with the surname preceding the given name. Surnames are typically one character in length, though a few uncommon surnames are two or more syllables long, while given names are one or two syllables long. There are 4,000 to 6,000 surnames in China; about 1,000 surnames are the most popularly used. A small group of southern Han Chinese in Guizhou Province still retaining their daily attire in Ming Dynasty (fourteenth - seventeenth century) style due to the relative geographical isolation and the strong adherence to traditional culture. Today, Han Chinese usually wear Western-style clothing. Few wear traditional Han Chinese clothing on a regular basis. It is, however, preserved in religious and ceremonial costumes. For example, Daoist priests dress in a fashion typical of scholars of the Han Dynasty. Ceremonial dress in Japan, such as that worn by Shinto priests, is reminiscent of ceremonial dress in China during the Tang Dynasty. The traditional Chinese clothing worn by many Chinese females in important occasions such as wedding banquets and Chinese New Year is called the qipao. The qípáo (旗; 袍), qípáor (旗袍儿), or ch'i-p'ao, often known in English as the cheongsam or mandarin gown, is a body-hugging (modified in Shanghai) one-piece dress for women. In the seventeenth century, Manchurian conquerors (Qing Dynasty) who invaded the Ming Dynasty and ruled China until the early twentieth century, outlawed the native Hanfu clothing and replaced it with the qipao. Chinese Han people traditionally lived as extended families in large houses that were rectangular in shape. This type of house is called sì hé yuàn (四合院). These houses had four rooms in the front, the guest room, kitchen, lavatory, and servants' quarters. Across from the large double doors was a wing for the elderly in the family. This wing consisted of three rooms: a central room where the four tablets, heaven, earth, ancestor, and teacher, were worshipped; and two rooms attached to the left and right which were bedrooms for the grandparents. The east wing of the house was inhabited by the eldest son and his family, while the west wing sheltered the second son and his family. Each wing had a veranda; some had a "sunroom" made from a surrounding fabric supported by a wooden or bamboo frame. Every wing was also built around a central courtyard used for study, exercise, or nature viewing. The traditional diet of the Han Chinese consists mainly of rice, and varies quite a bit from region to region. In the north, where the Mandarin Han are predominant, there is more grazing area, and more beef and chicken are consumed. In the south, where the Cantonese Han are predominant, fish is more common. Meals are eaten with the family and this time is very important to the Han. Chinese has a rich history of classical literature dating back several thousand years. Important early works include classics texts such as Analects of Confucius, the I Ching, Tao Te Ching, and the Art of War. Some of the most important Han Chinese poets in the pre-modern era include Li Bai, Du Fu, and Su Dongpo. The most important novels in Chinese literature, or the Four Great Classical Novels, are: Dream of the Red Chamber, Water Margin, Romance of the Three Kingdoms, and Journey to the West. Han Chinese have played a major role in the development of the arts, sciences, philosophy, and mathematics throughout history. In ancient times, the scientific accomplishments of China included seismological detectors, matches, paper, dry docks, sliding calipers, the double-action piston pump, cast iron, the iron plow, the multi-tube seed drill, the wheelbarrow, the suspension bridge, the parachute, natural gas as fuel, the magnetic compass, the relief map, the propeller, the crossbow, gunpowder and printing. Paper, printing, the compass, and gunpowder are celebrated in Chinese culture as the Four Great Inventions of ancient China. Chinese astronomers were also among the first to record observations of a supernova. Chinese art, Chinese cuisine, Chinese philosophy, and Chinese literature all developed over thousands of years. Numerous Chinese cultural sites, such as the Great Wall of China and the Terracotta Army, are World Heritage Sites. Since the start of the program in 2001, aspects of Chinese culture have been listed by UNESCO as Masterpieces of the Oral and Intangible Heritage of Humanity. Throughout much of history, successive Chinese Dynasties have exerted influence on their neighbors in the areas of art, music, religion, food, dress, philosophy, language, government, and culture. In modern times, Han Chinese form the largest ethnic group in China, while an overseas Chinese diaspora numbering in the tens of millions has settled in and contributed to countries throughout the world. In modern times, Han Chinese have continued to contribute to mathematics and the sciences. Among them are Nobel Prize recipients Steven Chu (朱棣文), Samuel C. C. Ting (丁肇中), Chen Ning Yang (楊振寧), Tsung-Dao Lee (李政道), Yuan T. Lee (李遠哲), Daniel C. Tsui (崔琦), Gao Xingjian (高行健), Fields Medal recipient Shing-Tung Yau (丘成桐), and Turing Award recipient Andrew Yao (姚期智). Tsien Hsue-shen (錢學森) was a prominent scientist at NASA's Jet Propulsion Laboratory, while Chien-Shiung Wu (吳健雄) contributed to the Manhattan Project. Others include Dr. David Ho, one of the first scientists to propose that AIDS was caused by a virus; this led Dr. Ho and his colleagues to champion combination antiretroviral therapy. Dr Ho was named TIME magazine's "1996 Man of the Year." The definition of the Han identity has varied throughout history. Prior to the twentieth century, some Chinese-speaking ethnic groups like the Hakka and the Tanka were not universally accepted as Han Chinese, while some non-Chinese speaking peoples, like the Zhuang, were sometimes considered Han. Today, Hui Chinese( 回族) are considered a separate ethnic group, but aside from their practice of Islam, little distinguishes them from the Han; two Han from different regions might differ more in language, customs, and culture than a neighboring Han and Hui. During the Qing Dynasty, Han Chinese who had entered the Eight Banners military system were considered Manchu, while Chinese nationalists seeking to overthrow the monarchy stressed Han Chinese identity in contrast to the Manchu rulers. Upon its founding, the Republic of China recognized five major ethnic groups: the Han, Hui, Mongols, Manchus, and Tibetans, while the People's Republic of China now recognizes fifty-six ethnic groups. Traditional Han society has three basic classes: the Mandarins (bureaucrats and aristocrats); a class of peasants, workers and artisans; and the "mean people," those who are outcasts of society. These classes are now officially banned, but many remnants exist. While the class structure was somewhat rigid, there was still the possibility of social mobility in Han society, through the imperial Civil Service Examination system, which allowed talented individuals from the worker class to become Mandarins. It was impossible, however, for those in the lowest class to raise their status. The Han have been dominant in China since the founding of the Chinese Empire, except for two periods totaling 400 years. The Mandarin class was made up entirely of Han, as was the massive bureaucracy of the Chinese Empire, even during the periods when the Han were not in direct control. To the Han Chinese, family is extremely important. The oldest male in a family is respected as the head of the household. The traditional Han family consists of the entire extended family. It is considered the duty of the son to take care of his aging father until his death. In addition to a diversity of spoken languages, there are also regional differences in culture among Han Chinese. For example, China's cuisine varies from Sichuan (四川)'s famously spicy food to Guangdong (广东省)'s Dim Sum (點心) and fresh seafood. However, ethnic unity still exists between these two groups because of common cultural, behavioral, linguistic, and religious practices. According to recent scientific studies, there are slight genetic differences throughout China. Due to several waves of immigration from Northern China to Southern China in China's history, there are strong genetic similarities in the Y chromosome between Southern and Northern Chinese males. However, the mitochondrial DNA of Han Chinese increases in diversity as one looks from Northern to Southern China, which suggests that many male migrants from northern China married with women from local peoples after arriving in Guangdong, Fujian, and other regions of Southern China. As this mixing process continued and more Han people migrated south, the people in Southern China became Sinicized and identified themselves as Han. Historical documentation indicates that the Han were descended from the ancient Huaxia tribes of northern China. During the past two millennia, the Han culture (that is, the language and its associated culture) extended into southern China, a region originally inhabited by the southern natives, including those speaking Dai, Austro-Asiatic and Hmong-Mien languages. As Huaxia culture spread from its heartland in the Yellow River basin, it absorbed many distinct ethnic groups which then came to be identified as Han Chinese, as these groups adopted Han language (or variations of it) and customs. For example, during the Shang Dynasty, people of the Wu area (吳), in the Yangtze River Delta, were considered a "barbarian" tribe. They spoke a distinct language that was almost certainly non-Chinese, and were described as being scantily dressed and tattooed. By the Tang Dynasty, however, this area had become part of the Han Chinese heartland, and is today the most densely populated and strongest performing economic region in China, the site of China's largest city Shanghai. The people in the Wu area today speak the Wu dialects, which are part of the Chinese language family but are mutually unintelligible with other Chinese languages/dialects, and do not see themselves as a separate ethnic group. The Wu area is one of many examples involving the absorption of different cultural groups which contributed to the diversity of culture and language throughout the Han Chinese ethnic group. ↑ Definition of "Han" in the American Heritage® Dictionary of the English Language: Fourth Edition. 2000. Retrieved December 16, 2007. ↑ Minorities and Regions, Index-China.com. Retrieved December 16, 2007. ↑ Jon Zetzman. Han Chinese. Minnesota State University, Mankato. www.mnsu.edu. Retrieved December 16, 2007. ↑ Clayton D. Brown Clayton D. Brown. "Making the Majority: Defining Han Identity in Chinese Ethnology and Archaeology" Doctoral Thesis. Retrieved December 16, 2007. ↑ Bo Wen et al. Table from "Genetic evidence supports demic diffusion of Han culture." Nature 431 (September 16, 2004): 302-305. Letters. Wiens, Herold J. 1967. Han Chinese expansion in South China. [Hamden, Conn.]: Shoe String Press. This page was last modified on 28 January 2014, at 22:00.